Katz Web Design has been developing this project during the past few months, on weekends and late at night. The time has come to launch a new forms generator for Constant Contact users. 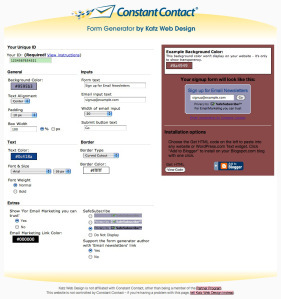 Why use the Constant Contact form generator? I love Constant Contact, but I have to say, I’m not wild about their default form designs. I set out to create a form generator that would provide users with more design options.